23a. 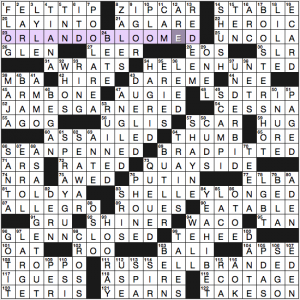 ORLANDO BLOOMED [___ into a major film star]. 34a. HELEN HUNTED [___ for just the right film role]. 52a. JAMES GARNERED [___ several filmmaking awards]. 66a. SEAN PENNED [___ a new film adaptation]. Except pen is the verb and Penn his name. 69a. BRAD PITTED [___ two film studios against each other]. Except pit is the verb and Pitt his name. 83a. 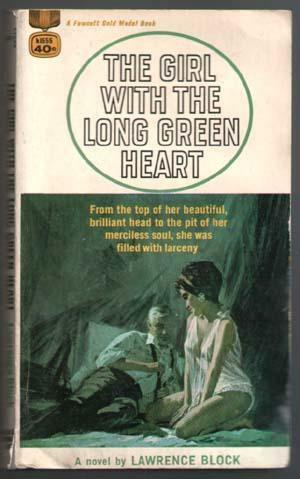 SHELLEY LONGED [___ for meatier film roles]. 96a. GLENN CLOSED [___ the film deal]. 111a. RUSSELL BRANDED [___ himself as a big-screen film star]. Theme works fairly well, though the clues aren’t playful, just straightforward connections to the verb/name. The fill-in-the-blank sentences put me in mind of many a Merl Reagle theme, though Merl’s narrative themes unspooled a continuous story. The fill is mostly easy and ordinary stuff, not too much in the way of crosswordese or awkwardness (SEGO, EATABLE, SRIS, ONE-L, weird TEHEED that would probably have been modestly better as TEHEES crossing à votre SANTÉ). There are perhaps more names than usual, which adds to the challenge for many solvers, particularly since the theme relies on knowing names too. 69d. [Gable part], BUTLER. I thought I needed an architectural term, but no. It’s Clark Gable who played Rhett BUTLER. Tricky clue! 57d. [Michael ___, Brett Halliday detective], SHAYNE. Never heard of this character or the author. A little before my time. The only Shayne I know is the guy who created and runs Learned League online trivia. 84d. [“A likely story!”], “YEAH, I BET.” Good answer. Yawn. We made our annual “Nutcracker” pilgrimage to NYC last night, and I’m tired. I’m so tired I forgot to turn on the timer for this puzzle and it took me longer than it should have to figure out what was going on. Some of the answers don’t fit in the grid. The letters left over form six words, and each of those is clued by an answer in the puzzle. Layers upon layers. If that’s not clear, let me explain. The answers to 1d through 4d are SOLD, AGEE, FLED, and EERIE, but each has only three squares in the grid and the crossings match the last three letters. If you were doing this on paper, you would write SAFE above the grid. 45a [Broker’s demand, and a description of a hidden word in this puzzle] is MARGIN CALL. That would be SAFE in the margin of the puzzle. All clear now? 28a [San Diego or Detroit, e.g., and a description of a hidden word in this puzzle] = BORDER TOWN, which is BURG (formed from BATON, UNIX, RARE, and GLEN). 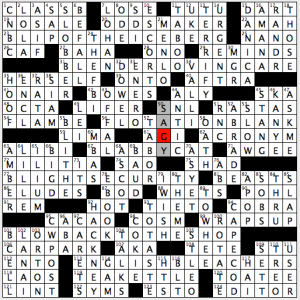 64a [Certain bonus, and a description of a hidden word in this puzzle] = FRINGE BENEFIT, which translates to PERK (PONCE, EMAILS, RAPT, and KNEE). 73a [Ball-handling and outside shooting skills in basketball, and a description of a hidden word in this puzzle] = PERIMETER PLAY, with PLAY used in the theatrical sense to mean SHOW (BOAS, ARCH, DINERO, and RENEW). 92a [Atlantis environment, and a description of a hidden word in this puzzle] = OUTER SPACE, which is AREA (SASHA, BEER, LAME, and ELSA). I was glad to see LAME clued as [ ____ duck] rather than in the ableist slang sense. 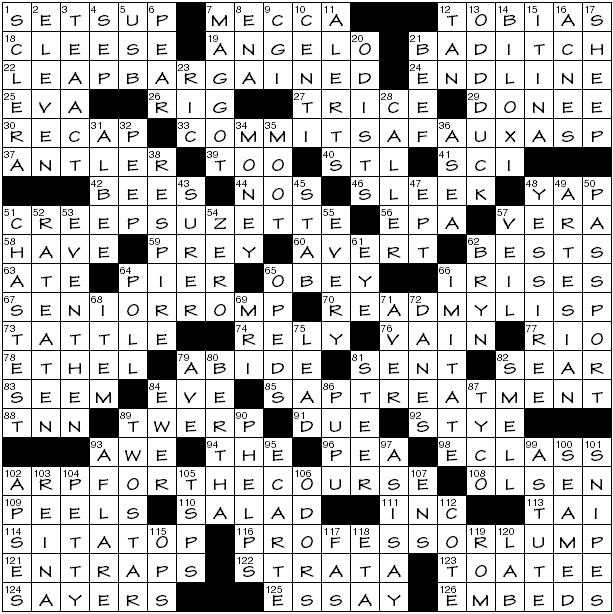 106a [Insincere words, and a description of a hidden word in this puzzle] = LIP SERVICE, and we’re talking religious service here; it’s MASS (BEAM, ARIA, HANS, and LASTS). That’s a lot of theme material, and an impressive feat of construction. I am not always a fan of puzzles-within-puzzles, but I liked this one. 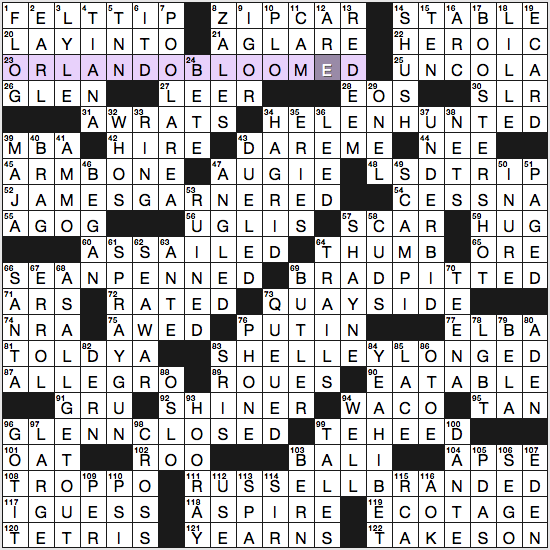 I didn’t find a lot of crosswordese, either, which sometimes happens in a theme-heavy puzzle. 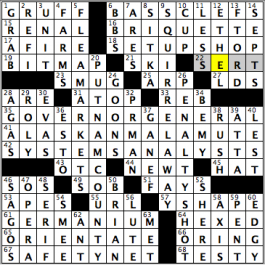 And each of the “hidden” answers leaves actual words in the grid – really quite an accomplishment. Nicely done, Evan. The NW corner gives us 1a [Stare salaciously] and 19a [Look lasciviously] for OGLE and LEER. Attractive alliteration abounds. I get the string tie and the weapon confused, so I entered BOLA for 5a [Tie seen at a hootenanny, perhaps] and that slowed me down a lot. Once I corrected it to BOLO, I saw that 8d [Weird types] was ODDBALLS and everything got much easier. Tense confusion, at least in my head: 72a [Flushed a bit, say] is REDDISH, not past tense. 86d [Place for pickup lines?] is BUS DEPOT, crossing 114a [Banking site?] for POOL TABLE. We do like our puns. 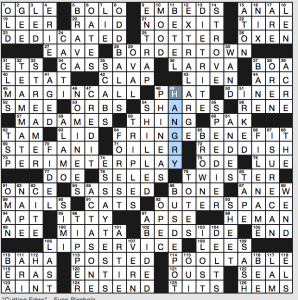 49d [Modern portmanteau that means “famished and furious”] is HANGRY, a word I first heard used by our esteemed blogmistress. What I didn’t know before I did this puzzle: that DIET RITE was introduced in 1958. Good day, everyone! Here’s hoping you have a good Sunday in store. Some of you may very well spend it in FARMS (4D: [Produce producers]) and/or FLEA MARKETS, which wouldn’t be a bad way to close the weekend (5D: [Swap meets]). Before getting a haircut and getting myself ready to head to Connecticut, it’s time to break down today’s Sunday Challenge, constructed by Martin Ashwood-Smith. If you were expecting a triple stack, you got it in the middle, and none of them were too tough, especially, for myself at least, when I was correct with my hunch of ALASKAN MALAMUTE (41A: [Nome tower?]). They are majestic dogs, aren’t they? I think I had heard of GOVERNOR GENERAL in passing a couple of times, so it wasn’t hard to see that in the grid after getting a few of its crossings (35A: [Ceremonial position in British Commonwealth countries]). Actually really liked seeing the Morse Code clue for S.O.S. (46A: […—…]). I dare you not to have The Police’s song (Sending Out An SOS) in your head right now!! Also liked the clue for PENALTY SHOT, as you could be talking about a myriad of sports that can feature it: hockey, soccer, European handball, and more (26D: [It often results in a goal]). In field hockey, I think their penalty shot is called a “penalty stroke.” Fun grid, and I can even think about the summer with BRIQUETTE, even though I’m about to put on my tights and make sure I don’t freeze when going out right now (16A: [Charcoal chunk]). “Sports will make you smarter” moment of the day: RUSH (38D: [Go quickly]) – Starting about 15 years ago, the RUSH brothers started making names for themselves in college and professional basketball. While JaRon Rush, who was a star at UCLA between 1998 and 2000, did not get drafted by an NBA team, his younger brothers Kareem (2002) and Brandon (2008), both were drafted in the first round of the NBA Draft. Brandon, who won an NBA title with the Warriors in 2015, currently plays for the Minnesota Timberwolves. 23a, BLIP OF THE ICEBERG [Warning technologically unavailable in Titanic times?]. 31a, BLENDER LOVING CARE [Passionate maintenance of one’s Cuisinart?]. 56a, FLOTATION BLANK [Forgetting how to stay up?]. 67a, BLABBY CAT [Feline snitch?]. 77a, BLIGHT SECURITY [Junkyard guards?]. 101a, BLOW BACK TO THE SHOP [Haul in à la the Big Bad Wolf, as a wrecked vehicle?]. 113a, ENGLISH BLEACHERS [Where a chant of “Well done, blokes!” might start?]. One of the more successful “replace a letter” themes I can remember in recent history. The title, “Hold the Tomato,” ties everything together fairly nicely (BL, no T), and I liked most of the seven base phrases and theme answers. “Tow back to the shop” struck me as slightly less idiomatic than the other six, but I like the image of the Big Bad Wolf blowing a car back to the shop. The fill is pretty smooth as well, though there’s a section near the NW that has ENCL, OCTA, and RATA all in a 4×4 block. Other than AMAH, SETT, ENTO, and the crossing of SAGY/AGI, not a lot else to nitpick. Not much long fill in this one, though, so not a lot of sparkle in the surrounding fill. TEA KETTLE and ODDSMAKER are good, and I liked seeing DANICA Patrick in the grid too. Well, my day was unexpectedly sidetracked. Better late than the other thing, eh? In this week’s theme, words have had their P transferred to the tail end, to wackify the original phrase. I suppose the title is meant to be interpreted as p-late (re)settings, or something to that effect. 22a. [Negotiated a base jump?] LEAP BARGAINED (plea …). Pretty sure BASE should be capitalized here. 33a. [Sends the fake snake to the loony bin?] COMMITS A FAUX ASP (…pas). 51a. [French lady who’s kind of a jerk?] CREEP SUZETTE. So apparently it isn’t words with initial Ps. 67a. [Easy win from the elderly?] SENIOR ROMP (… prom). 70a. [Thee thethe wordth, thay?] READ MY LISP (… lips). 85a. [Doofus’s medical procedure?] SAP TREATMENT (spa …). 102a. [Dadaist painting on Pebble Beach?] ARP FOR THE COURSE (par …). 116a. [Chunky teacher?] PROFESSOR LUMP (… Plum). The only theme answer with more than one P. The second P isn’t relocated (to the end of its word, say), either. So. What seems like a couple of major inconsistencies. Five of the eight theme answers started out with the P in the first part of the word, three have them relocated from the penultimate spot. And then the extra P entry. 21a [Persistent irritation] BAD ITCH. Green paint? 114a [Straddle over] SIT ATOP. I had SET ATOP, didn’t see until much later that the key crossing was 103d [“Palacio” leader] REINA. 1d [61 Down part] SCLERA, 92a [61 Down inflammation] STYE. 61d is, you guessed it, EYE (cross-referenced to the other clues). 105d. [Baking meas.] TSPS. Wait, we were supposed to understand that the abbreviated clue was for a plural? I cry foul. 3d [Law that led to a “party”] TEA ACT, 94a [Patisserie quaff] THÉ. 6d [Still life fruit] PEAR, 84d [Pitcher with a big mouth] EWER. 49d [Type of well] ARTESIAN. I’ve heard some people pronounce ‘artisan’ as if it were ‘artesian’ and was unable to discern from context precisely in which way they were ignorant. 75d [Pencil contents] LEAD. “Lead”, that is, since it’s actually graphite. In regular pencils. 82d [Nose wrinkler] SMELL, 106d [Nose wrinklers] ODORS. 93d [Glowing, as if lit by fire] AFLARE. That isn’t what this unusual word means, is it? Apologies for not highlighting some of the more fun and clever clues, but I must run. This entry was posted in Daily Puzzles and tagged Brendan Emmett Quigley, Bruce Haight, Evan Birnholz, Garry Morse, Martin Ashwood-Smith. Bookmark the permalink. I really liked Evan’s puzzle, but it made my head hurt trying to keep the hidden words in mind while figuring out which went with which of the other clues. I wrote them down on paper and matched them up after I’d finished the puzzle. Couldn’t do it in my head. Special credit to Evan for making each of the words with border letters be a word even without the border letter. Just added elegance. Here’s a color-coded version of the Post puzzle solution that I think makes it easier to visualize which hidden words go with which theme answer. Enjoyable puzzle, though struggled with the south west part as I’d never heard of Russell Brand and some of the crosses were new to me.